Kitchen countertops impact the overall look and feel of your kitchen. This work-center of the room is a direct reflection of your lifestyle, and it sets the tone for the rest of your design choices. 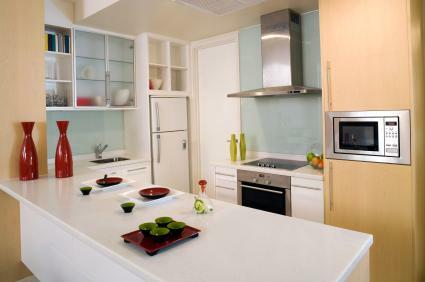 Get the right kitchen countertop for you by examining the maintenance needs, style and features of all of the options. Laminate counters offer an economical choice and a host of colors and patterns for renovating your kitchen. Newer laminate counter options give you the look, durability and feel of granite, marble and other more expensive options, but for a lot less. While laminate counters are fairly durable and stain resistant, they are not entirely scratch or heat resistant. Always use a cutting board when using knives and avoid setting hot cookware down on top of them. They do not require sealing or special cleaners. Laminate counters are one of the more inexpensive options for kitchen counters. Laminate is easier to install than other counters, which means a DIY homeowner may be able to complete the job. Laminate is fairly low maintenance and doesn't require sealing. Laminate can scratch more easily than some types of counters. You shouldn't put a hot pot on a laminate counter as heat may melt or burn the surface. Laminate can come loose from the foundation over time if the adhesive bond gives way. Granite is a coarse-grained igneous rock that was once molten and formed as it cooled within the earth. Available in a variety of colors, minerals within granite appear as small flecks throughout the stone, although some types of granite have veining similar to marble. Granite comes in a variety of finishes and its extremely hard surface can be highly polished. Granite is a popular choice because of its durable, hard-to-scratch surface and beauty, but it is one of the more expensive options for countertop material. Because granite is a natural material, no two slabs are ever exactly the same. Visit a stone yard or fabricator in your area to view the individual slabs before making your decision. This will enable you to see the exact coloration and surface pattern of the slab you are considering. Granite can absorb liquids; blot up spills immediately, before they penetrate the surface. Acidic substances such as lemon juice, vinegar and some cleaners can etch granite so these must be wiped up immediately as well. Be sure to clean your granite counter with a few drops of neutral PH cleaner like stone soap, or mild dishwashing liquid and warm water. Some granites require sealing on a yearly basis to help protect the surface, create a seal against germs and continue to impede staining. If you take good care of your granite countertop, it will stay looking new for years. Granite is very hard and resistant to both heat and scratches, so hot pans and knives are unlikely to damage it. Granite has a unique beauty that cannot be produced by man-made materials. 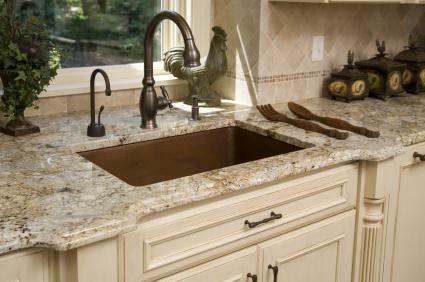 Granite counters are expensive, in part because they must be templated and constructed to your exact specifications. Granite can be extremely high maintenance; some light-colored granites stain easily and require frequent sealing. Concrete counters are a dynamic product that show off texture and detailing unlike other solid products. However, concrete is porous in nature and absorbs stains; it must be sealed on a regular basis to impede staining. Since concrete kitchen countertops are engineered, they are either poured and cured prior to installation or made directly on top of your cabinets. Concrete counters can be stained or dyed in a variety of different colors, and may have imprints or designs cast right into their surface. Speak to a concrete worker in your area about fabricating a concrete counter that is suited to your kitchen. 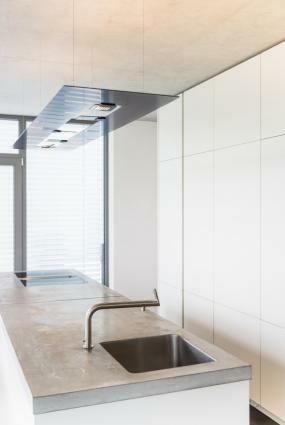 Concrete kitchen counters should be washed with mild soap and water. Cleansers and abrasive pads that contain solvents or abrasives can harm or scratch your concrete countertop. Wipe up acidic liquids like wine, vinegar and other substances like lemon or tomato juice immediately to prevent them from damaging the surface. Concrete counters are cast to your specifications, which means you can customize their appearance and color. Concrete counters can have drain boards and inserts for cutting boards formed within them. Concrete counters often have an integral sink. Concrete counters may be expensive, depending on the contractor doing the work. Concrete stains easily and requires frequent sealing. 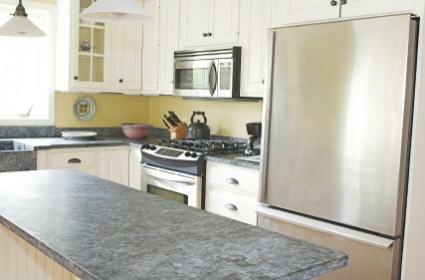 Soapstone countertops are a natural, non-porous material. They don't stain and are resistant to chemicals, acids, stains and heat. Soapstone has a warm, soft feel and a smooth, matte texture. The color of the stone is usually blue, green or gray, and many stones may have lighter veins running through it. Ask for soapstone at the granite yard. Most granite fabricators will also carry a selection of soapstone counter slabs, and their cost is on par with most other stone counters. While soapstone is very durable, it does scratch easily. If you find a scratch on your soapstone counter, sand it lightly or treat it with mineral oil to remove it. All soapstone darkens naturally over time, but may do so unevenly depending on the conditions in your kitchen. Oil your soapstone yearly with mineral oil to help it darken uniformly. Soapstone is extremely durable and nonporous, so it will not stain. Soapstone is beautiful, with a unique finish and texture. Soapstone requires frequent oiling to help it darken uniformly. Soapstone is expensive with the more exotic colored stones costing more than most granites. Warm wood counters have a lustrous appeal and complete the look for a country kitchen. 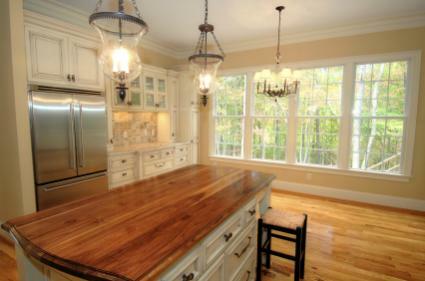 Hardwoods like oak, maple, cherry, red beech, walnut, teak and mahogany are preferred for countertops. 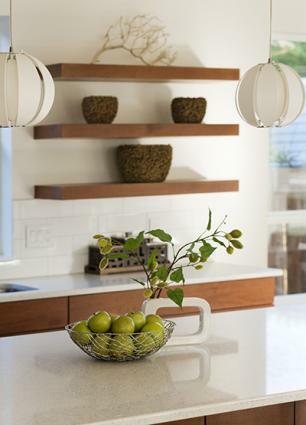 Each species of wood has a specific grain or pattern that complements the look of the kitchen. Some patterns and grains can be enhanced through staining. Wood counters are one of the more sanitary kitchen countertop choices; wood's natural properties work to protect it from bacteria build-up. While wood has a natural patina, it will scratch and stain over time. Use a cutting board and wipe up stains immediately. Apply mineral oil to the wood, particularly around the sink area to help impede staining, and do not place hot cookware directly on the counter. Wood has a natural beauty and patina that enhances any kitchen design. Wood can be sanded and refinished several times. Wood scratches and burns easily. Wood may swell in humid areas, warping the counter. Wood requires sealing and maintenance to avoid stains. 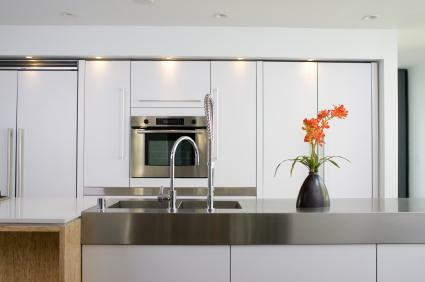 If you're looking for a contemporary look for your kitchen, consider a stainless steel counter. Stainless steel provides a chic look, and is available in polished, brushed, matte, hammered and textured finishes. Stainless steel resists bacteria growth, which makes it a more sanitary choice as well. Stainless counters are often made on site for your kitchen; speak to a metal fabricator near you to get a quote. Unlike stone counters, this stain-resistant surface can be bleached. It does scratch; avoid using abrasive cleansers, and always use cutting boards when using knives. Stainless counters are naturally sanitary and antibacterial. Stainless steel does not stain or require special cleaners. Stainless counters often use integral sinks. Stainless steel counters can be very expensive. Stainless counters show fingerprints easily. Solid-surface counters are also available in a wide array of colors and styles. Veins, color-flecks and solid colored counters are available to suit a number of different kitchen designs. 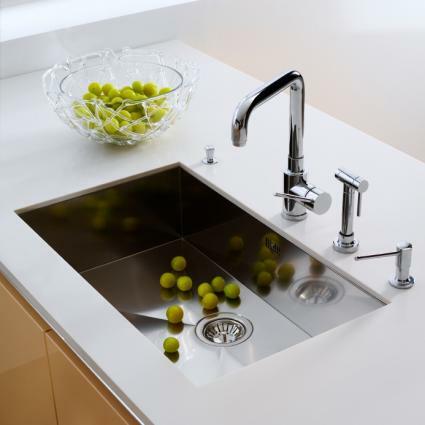 Oftentimes the sink in a solid-surface counter will be integral to the rest of the counter as well. Care of solid surface counters is easy and doesn't require special cleaning products. Soapy water, ammonia-based cleaners or commercially available cleaners designed for solid-surface counters remove dirt and residue from all three finishes. Varying hues may require more frequent cleaning to maintain a uniform finish. 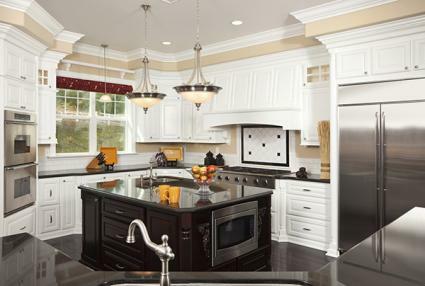 Darker colors have a tendency to require more attention than lighter counters. If the counter becomes scratched, buff the scratches out with a scrubbing pad. Solid-surface counters can be easily repaired if they become scratched. Solid-surface materials are non-porous and don't promote bacteria growth. Solid-surface surfaces require no special cleaners or sealers. Solid-surface counters are expensive, costing roughly the same as a mid-range granite. Solid-surface counters scratch, melt and burn; extreme care must be taken with knives and hot pots in the kitchen. An attractive alternative to both natural stone and solid surface counters are engineered stone counters. Made of 90 percent quartz held together with a resin, these counters do not scratch, burn, melt or stain, making them virtually maintenance-free. Each manufacturer has its own color palette and characteristics with some appearing like granite, others like limestone and some with vivid, bold colors like orange or lime green. Engineered stone counters are virtually maintenance-free. They require no special products or care, but some of the more solid colors may show water spots if a spill is allowed to dry on them. Engineered stone counters require no sealers, special cleaners and only need minimal routine maintenance. Engineered stone has the ability to mimic the look of natural stone or concrete. Engineered stone is available in several unusual colors not offered by other materials. Engineered stone is quite expensive, costing about the same as a mid- to high-range granite. Ceramic tile is a popular, economical kitchen countertop option. Lots of types of tile are suitable for countertop use, which provides an array of different colors and patterns to choose from. Speak to a tile contractor about customizing a tile countertop for your home. All tile countertops require grout, which will require sealing on a regular basis to help impede staining. The tile itself may be high or low maintenance depending on what material is used. Stone tiles will require more care than porcelain or ceramic tiles. If installed by the homeowner, tile counters can be inexpensive depending on the materials used. However, professional installation may cost more than other types of counters. Tile counters can be installed by most DIY homeowners. 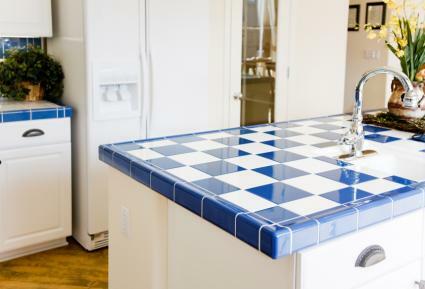 Tile counters can be customized in nearly any color or pattern to suit the rest of the kitchen design. Tile counters contain a lot of grout, which may stain, chip or crack. Some types of tile may stain, scratch or require additional maintenance when used on a counter. When considering your kitchen remodeling costs, you have more countertop choices than ever to choose from. Weigh the pros and cons of each counter material as you make your choice. Consider the look, cost and maintenance of your counter selection before purchasing. Remember that a good countertop is an investment that can last for the life of the kitchen. Make your decision carefully and take home samples of the various materials to view in your kitchen before making a commitment. In the end, your new countertop will set the scene for a beautiful new kitchen design.